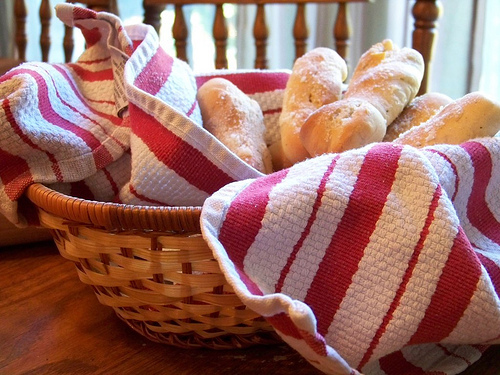 There’s something about the smell of homemade bread wafting through your house. Not only does it smell so welcoming, but fresh-from-the-oven bread is beyond delicious! Best of all, you can save over $100 per year by making your own homemade bread! I love to use my homemade bread machine to mix up the dough for homemade bread. It makes it so simple — and it takes less than five minutes to measure and dump all the ingredients into the machine and clean up the little bit of mess you made. What If You Don’t Have a Bread Machine? If you don’t have a bread machine, don’t go out and spend a bunch of money on one. Instead, ask around and see if any of your friends have a bread machine they aren’t using that you could borrow. Or check area garage sales, Craigslist, or thrift stores. You can also use a KitchenAid or Bosch to mix the dough. Or, you can just do it the old-fashioned way and just knead it by hand — but that does make it more time-consuming. How Much Can You Save By Making Your Own Homemade Bread? Kristen from The Frugal Girl did a very thorough investigation into how much it you’ll save by making your own homemade bread. She estimated that you’ll save at least $0.50 per loaf if you typically buy the very cheapest bread on the market (that typically sells for $0.99 per loaf). However, if you typically buy a little bit higher quality bread (that usually retails for $2-$3 per loaf, than you’re going to be saving $1.50 to $2.50 per loaf. So, if you usually buy 2 loaves of bread each week, that’s a savings of $156 to $260 per year. And if you make all of your own homemade breads, such as cinnamon rolls, pita pockets, breadsticks, rolls, and more, you’re going to save even more! Do you make your own homemade bread? What are some of your favorite homemade bread recipes? Making homemade bread is great. We don’t have a bread maker, so I just knead mine. I find it relaxing (and good exercise). We get our yeast at Costco and save so much money that way! Thank you so much for this series. It is exactly what I need to give me a kick in the pants to start some new habits. This is a great post with recipes that you have used several times. Gluten free favorite: Millet Oatmeal bread from gluten free mommy. I have shared this bread and recipe with several GF friends who make this regularly now. My best tip is to assembly line bread mixes in quart bags, freeze them and then make it in the breadmaker on the quick bread cycle. I was just going to post to see if anyone had ever used a bread machine for GF bread! Thank you so much for your comment, Melissa. It’s very helpful for our GF family. If you go over to simple organized living she has a great recipe for english muffin bread that you don’t need a bread maker for. It is real easy to make and tastes great. My husband bought me a bread machine for Christmas (West Bend High Rise). It’s not an expensive machine, but so far it works great! When I read the directions for the first time I felt overwhelmed and wanted to cry–I was certain that I wouldn’t want to use it regularly and my husband would think I didn’t like the gift…but then I tasted the first loaf and I was hooked! I found a good, easy recipe for homemade wheat bread that we love. I much prefer the taste, texture and the crispy crust to storebought bread. For me it was more of a hobby I wanted to try, but it will be nice if there is some cost savings, too. Please share a link to the recipe for homemade wheat bread. Here’s the recipe that I use for 100% whole wheat bread. We love it and it’s easy too. I got that for myself when it went on sale in December. It is replacing my 20+ year old bread machine that my parents passed on to me. The old one still works but it makes the tall round loaf and since it is not easy to use for sandwiches (well packed sandwiches), I didn’t use it as often. The horizontal loaf is so much more practical! I was given an older model like yours. I Cut the tall loaf in half (at it’s “waist”, so to speak). then I turn that half cut side down and slice down from the top, into slices. Do this with both halves and you will have more average sized slices. 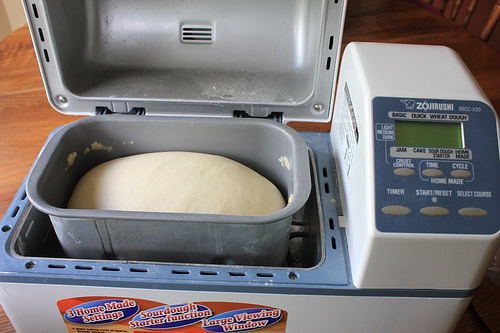 Do you have a good Pizza crust recipe for the bread machine? We are trying to save money by making our own pizza rather than ordering out. I’m looking for a crust that is comparable in taste to take out pizza. Check allrecipes.com. That’s where I found mine and it is really good. It’s a quick one, so it only rises once, which is even better. Just look at the ratings. I always like to read the reviews too — they have good tips. I make it in the Kitchenaid now, but the bread machine did a nice job, too! The pizza dough I make in the bread machine and have for more than ten years is from allrecipes. It’s called Jay’s Signature Pizza Crust: http://allrecipes.com/recipe/jays-signature-pizza-crust I just put the ingredients into the machine according to my machine’s instructions and it’s perfect every time. It makes a giant pizza crust or two regular size. I always use Crystal’s recipe and we have had great success! It is super simple, and you can freeze it. Just make sure to put it straight in the freezer —I waited once until after I put the pizza we were having that night in the oven and the dough rose a ton! I also love Crystal’s pizza dough recipe. It is sooo easy to make. I make it about 2 or 3 times a month. My kids & husband looove it !! Mix/knead until smooth. Let rest 20 minutes before rolling/pressing into pans, or use it straight away for a thinner crust. This makes a very stiff dough that is easy to work with. It was originally a pizza dough recipe, but I have used it as the foundation for cinnamon rolls, bread sticks and cream cheese filled sweet bread (YUM!). It’s such an easy recipe to throw together, and no bread machine required. I do it in my kitchen aid, but you could knead it by hand too of course. Oh, and this will make 2 12inch pies, or one large rectangular baking sheet pizza. To get the “take-out” taste, I have to use a recipe with semolina flour or it just tastes like regular ol’ bread to me. Pizza crust should not have sugar in it. I lived in Italy twice, and adjusted my favorite pizza dough recipe for my bread machine. Here are the ingredients I place in my bread machine on the quick dough cycle and I get a great crust. when the dough is done, roll out on floured surface and place on UNgreased pizza pan. Depending on how big your pizza pan is and how thin you like your crust, you may have enough dough for 2 pizzas. For thicker crust, Bake at 425* on the lower rack for 12 minutes, then move the pizza up to the middle rack for 8 or 10 more minutes. Thinner crusts take less time. Check Gluten Free Girl’s blog-she’s got a lot of gluten-free baking recipes posted. Gluten Free Mommy’s Millet Oatmeal bread. Delicious and works great in the bread maker. I have always wanted to try this. I think i am putting it on my list of goals this year to start making all our bread from scratch. I am looking into bread machines, What are some recommendations? Honestly, I feel like they all work just fine. I use a cheapie Sunbeam now and am happy with it. King Arthur Flour recommends the Zojirushi and they know what they are talking about but it’s an expensive machine. I’m going to get one someday! I have a bread machine and I absolutely love it! My family has a tradition where we make our own pizza every Friday night. I make the dough in the bread machine and then prepare the pizza as usual. It is definitely a cost savings to bake your own bread. Not to mention the fact for those who are on gluten free diets it is a definite cost savings. Do you have a recipe for bread machine pizza dough?! Place ingredients into pan in the following order. Set it for the dough cycle. My goes for about 1 hour and 30 minutes. This will make two average size pizzas. Enjoy! I should have asked if this is a gluten free pizza dough…I’m guessing not? I have found that my homemade bread goes staler faster. I love the fact that it isn’t full of preservatives but I do enjoy the convenience of not have to make a loaf every other day when I buy store bought. Do you have any suggestions for making my loaves last longer? What’s the best way to store them? Slightly stale bread is optimum for French Toast, perfect for a weekend breakfast or Breakfast for Supper. At the end of the first day, slice what is left and put it in the freezer. Remove slices as needed and thaw, or microwave briefly, or toast. Tastes like fresh baked. I make 6 loaves at a time to be more efficient. After they are cooled, I cut the loaves in half and freeze them. Then I pull out 1/2 a loaf at a time as needed for sandwiches, etc. Any that gets stale goes for toast. Of course, we do eat plenty when it first comes out of the oven, all 6 do not make it to the freezer. I like to make bread in mini-loaf pans so I can use what we need and freeze the rest (I wrap in wax paper and then foil and reuse the foil). The mini-loaves defrost quickly. I don’t make sandwich bread though, but lots of other dinner breads. I actually put about a tablespoon of apple cider vinegar in my bread, which helps it last longer and doesn’t impact the taste at all. I also use a dough enhancer (homemade) and several of the ingredients help with that as well as holding the bread together better. I do freeze some of my bread too sometimes. I make sourdough bread a few times every week from a wild yeast starter. It is very easy to maintain and most days I keep the starter in the fridge, then take it out and feed it the day before I bake with it. The starter makes wonderful boules, English muffins and pizza dough. I will never go back to buying store bread again! Not sure which won out the other day, being frugal and not wanting to actually go to the store and pick up a loaf of bread or laziness…but I actually baked my first loaf of bread in my breadmaker! I bought it last summer from Craigslist for $25 used it to knead up a batch of your Cinnamon Rolls and that was it. I bought some local deals for bread from a discount bakery shop and was essentially stocked up through last week! What fun! My husband loved it too! We go through about 2 loaves of bread a month, but from now on I am only going to make it since it was so easy-peasy! I am happy to see it here because I wondered the savings too. Thanks! Oh, this is going to be an exciting series to follow! I was just thinking that I really need to start making bread again. The artisan bread in 5 minutes is the easiest thing ever and it tastes so good, I just love it. I’m glad you guys broke down the math. I’m no good with numbers and sometimes I wonder if I am really saving any money with all of my scratch cooking. I love homemade bread but the few recipes I have do not stand up well in lunch boxes. I will make PBJ for my kids and 4 hours later when they go to eat it, it is good but totally falling apart and extremely messy. Any suggestions? I even put the peanut butter on both pieces first hoping this might help….. I wanted to know about that too. Most of the bread we go through at our house is for sandwiches in packed lunches. I would also like to see suggestions on slicing homemade bread evenly for sandwiches. I have used the Presto Bread Slicing Guide with an electric knife for the past 17 years! I don’t think they make them anymore but I have seen them on Ebay. Great help with homemade bread…the slices are even and just like store bought! Practice! I had a guide that I used, but after making my own bread long enough, I’ve just gotten better at it and it comes out nice and even, so I gave the guide away. Also, dough enhancer really can help with holding your bread together so it is nice for slices. If you wait to slice it until after it cools, i’ts easier too. But warm bread is hard to resist. Another tip: wait until your bread is mostly cooled, but not all the way (85% maybe) and then put it in bags. That really helps your crust stay nice and soft. If you bag it too soon, it sweats and gets your bread too wet. All the way cool makes the crust not so soft. My kids really, really like the crust on the homemade vs. store bought with this little trick. I’ve been making my own homemade whole wheat bread for several years now — my kids don’t even like store bought bread anymore. I started with a bread maker too. But I really wanted to make all our bread, and with a big family, a bread maker wasn’t very practical. Lots of trial and error, trying lots of different recipes and I finally got there. I’ve even taught some bread making classes. I do use a Bosch and make 4 loaves a week. And it’s a one rise recipe, so from start to finish, it’s about an hour and 40 minutes to make. Slices great too. I’d be happy to share the recipe and tips, but don’t want to leave a LONG post. Bottom line, it’s worth the effort… so don’t give up! Add bowl one and mix in. Add 2 cups of regular white flour, a cup at a time, and mix in. Add bowl 2 and mix in. Add 4 T. dough enhancer. Add about 5 cups of whole wheat flour, one cup at a time while mixing until the dough gets just past the sticky stage. This is the key!! Just past the sticky stage is when you touch the dough and it no longer sticks to your fingers. If you add too much flour, your bread will be too heavy. Not enough and it will be hard to work with and can fall. Once it is to the right stage, mix for about 8-10 minutes on a medium speed. While it’s kneading, get your bread pans ready (this makes 4-5 loaves depending on the size of your loaf pans) by greasing them. Before you start forming your loaves, preheat your oven to 190 degrees. Form the loaves and place them in the preheated oven and turn off the oven. Set your timer for about 35 minutes. When your timer goes off, check to see if they have risen enough. When they are ready, turn your oven back on to 325 degrees and set your timer for another 35 minutes. When the loaves are a light golden brown, take them out. Let them sit for about 5 minutes and then remove them from the pans onto a towel or cooling rack. I like to take a cube of butter and run it over the tops while they are still warm. When they are about 85% cool, place them in bags (for nice soft crust) and slice when you are ready to use them. (The mixing and forming the loaves takes about 25 minutes total — the rest of the time is raising and cooking). LOVE this recipe!!!! You can half this recipe and use a KitchenAid. I use a Bosch for this. Thank you so much! Can I safely assume that the “dough enhancer” listed is vital wheat gluten? Also, can I ask you, how this bread, with a single rise, compares in height/texture/whatever else you can think of, to breads with a double rise. I’ve done the double rise, and I’ve done the Artisan Bread in 5 Min. a Day, but I wasn’t crazy about their whole wheat recipes, though I love the method and use it a lot for other kinds of breads/rolls/etc. We use a recipe out of a book titled Artisan Bread in Five minutes a Day. Checked it out from the library, and we only have to mix the ingredients, then store them in the fridge until we want to make bread. No kneading required, and it is soooo yummy! I just bought the book, I’m so glad to hear you like it. The Video made it seem too easy to make good bread. I’m excited to try it out. Where I live, the thrift stores have used bread machines for $2 or $3. Out of respect for my husband’s wishes, I still buy ‘sandwich bread’. I’ve yet to ever create a loaf that he liked for sandwiches, and I do a lot of baking. We buy the Sara Lee 45 calorie thin slice low carb stuff, and I think he likes it because it’s thinner and you can taste the meat, peanut butter, whatever is on there…better. I am able to get them at the bread outlet for .99 each, and a loaf lasts us at least a week, often longer. I make most of the other breads we eat – breadsticks, rolls, buns, muffins, quick breads, pizza crust, etc. I don’t make tortillas because they are cheaper for me to purchase, and the same with English muffins – I can get those at the outlet for .50 a 6 pack, rather than watching a over a skillet for such a long time. I still buy bread from the store for my husband to take sandwiches to work, too. We love homemade bread, but it’s too crusty and doesn’t have that “squishy” feel that works so well for sandwiches. Will have to try the recipe above. We can get thinner slicers if we use an electric knife to cut the bread. By “we” I mean my husband 🙂 I always end up cutting thick slices of bread by hand. He likes the thin slices for sandwiches. We just use French bread for sandwiches. This sounds like such an easy way to save. I made bread once, as a 9year old and have never made it since. But I do have a bread machine at my disposal, that was my fathers. Does any one have a recipe for a yeast bread, and a 100 % wheat bread (that is the only thing my husband will eat). I am very excited to try and make some!! I am so excited to try all these! Thank you so much!! I even created a pinterest board for this! I make the whole wheat bread recipe found on 100daysofrealfood.com. it uses 100% whole wheat. The sweetener is honey. Delicious. She uses a breadmachine, but I have made both by hand and with kitchenaid mixer. Comments on her post include alternate directions if not using machine. Its great bread! I love making bread.. and my husband loves when I do, too! I started out with a bread machine, but now I use the KitchenAid. I have better control of what the final product is when it isn’t hiding in a machine. I started with pizza crust, then dinner rolls, and now I’m pretty confident with yeast baking. For beginners, this is awesome: http://homejoys.blogspot.com/2011/01/miracle-bread.html Really easy, looks great, tastes great! Thanks for the web site tip. That miracle bread looks really cool to try. Once you get used to homemade bread it is hard to eat store bought bread. I have three bread machines and sometimes have all three going at once. The butterhorns are a definite favorite at much church. I cook 125 or so when we have a church dinner. No one brings bread any more. They have come to expect homemade bread. We’ve been doing this for several weeks now and my family loves it. We don’t have a bread machine but we use an easy, no-knead method that bakes in a Dutch oven. Super easy and delicious. Can’t wait to see your next tip! Honestly, it doesn’t take that long to mix up a batch of bread dough and knead it by hand – 15 minutes maybe? Then another 15 minutes to shape into loaves after it rises? I guess I’ve never timed it but I don’t feel like it takes that long for the actual hands on time. Yes, making bread takes a chunk of time for it to rise but you don’t have to be direcltly involved in that! Since I work outside my home, I usually bake bread sunday afternoons. Such a nice way to start the week and then we’re set with bread for the week too! If Sunday’s are too full in a given week, I do Saturday mornings. Both work great and I can get housework done (Saturday AM) or just relax (Sunday PM) while the bread is rising and baking. I really need to do this! I have both a breadmaker and a KitchenAid Mixer so I really don’t have any excuses! I buy the “better” bread rather than the cheap bread, so the savings would really add up fast! And the “better” bread still has stuff in it that I’m not excited about so it would be healthier too! Here is my favorite recipe. I use all whole wheat and the wheat gluten and potato flakes make it light and fluffy. I’m so excited for this series!! This is something I’ve wanted to start doing. We used to eat Wonder Bread, but now that is off the market, I can’t find a bread I like to replace it. I’m jealous of your bread machine. I have one, but it makes those more square loaves that when cut into slices would make a giant sandwich. I’m definitely going to look more into making our bread though! Mine is the same way, so I just use the dough cycle and then take it out and put in regular loaf pans to rise and then bake. Also, do they make loaf pans that are longer like a loaf of bread you would get from the store? But they don’t always raise as evenly as the regular loaf pans do. I use both. Out of cheapness I started making bread a few years ago. Then it happened. I turned my kids into bread snobs. I just made 3 loafs for the week today. I make it by hand because for me it is a stress release and I really enjoy the process of it. We make all our own bread products. One of our favorites is the English muffin bread but I only make it once in awhile because the kids go right through it. Wonderful new post. Can’t wait to see what is next. I love my homemade bread. I think it TASTES better than store-bought. Plus, I think it’s gross that store-bought takes so long to go bad (I don’t like preservatives in my food). I haven’t mastered 100% whole wheat, so I use 1/2 white flour & 1/2 whole wheat flour. I usually use my bread machine for making two loaves of dough, then bake them in the oven. I find it turns out better than baked in my OLD machine. Once the loaves are cool, I slice them with my electric knife (for more even slices), then pop one loaf in the freezer. I love making bread! If I don’t have time to make it I LOVE getting low sodium ezekiel 4:9 sprouted bread! I’ll never go back to regular or store bought bread again! Scald milk and add shortening. After shortening has melted add cold water. Add sugar and salt. Add three cups of flour & put yeast on top of flour. Then stir it around. Add remaining flour a cup at a time. Knead dough until smooth and then put into greased bowl. Let rise until double in bulk. Punch down and turn out lightly floured counter. Cut into pieces and form into loaves. Let rise until double in size. Bake at 350 until done approx. 25-35 minutes. I don’t have a bread machine, and I have a Kitchenaid. I don’t use it though because its just as much work to turn on the generator & wash everything as it is to just do it by hand. love homemade bread, but get frustrated trying to slice a straight piece with a knife. Any suggestions for a good loaf slicer? I totally agree. I can’t slice bread. I have to wait for my husband to slice the bread and I hate having to wait for him but I butcher bread if I cut it. This is a great series and I am excited to read what you will be posting! I do make bread but not nearly often enough – guess it’s time to change that habit! I really needed someone to tell me to do this. I have wanted to do it for so long but always just pick up some while at the store. The only problem I have is when a loaf is made, it gets eaten up much much much faster than a regular loaf does. I guess I need to hide them somehow and ration it out! Just make 4 loaves at once. A .25 loaf of bread eaten for snacks is a lot cheaper than buying snack foods! Perfect point! I love your site too btw…. 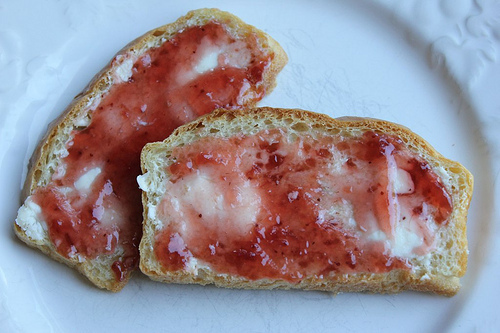 The english muffin bread that you have pictured is one of my favorites. I made your recipe not long ago and fell in love with it. So easy. So good! I am looking forward to following this series. We love our bread machines, sometimes having our two yard sale found machines going side by side twice in one day making everything from bread, to pretzel bites to pizza dough. I think I’m going to love this series! know I save WAY more than $100 a year by baking my own bread. I make organic, whole wheat bread from freshly ground wheat (it’s my hobby! 🙂 — equivalent to Great Harvest Bread Co. Their bread costs $5.50/loaf (and it’s not organic). My bread costs me under $0.50/loaf. We go through 2 loaves each week (I pack my kids’ lunches) so that’s $520 right there. Once you get into a bread baking groove, it really is easy. Then you move on to hamburger & hot dog buns, etc. to save even more! Jillbert, you sound like me! My hobby is baking bread, buns, rollls, etc. from freshly ground flour. I purchased my grain mill 10 years ago this month to make healthier bread with a fresh flavor. One of the things I haven’t seen mentioned here is that bread baking can actually be a convenience, especially when you have young children at home and it is the dead of winter. In the past I repeatedly would need a loaf of bread or buns for supper and just didn’t want to bundle up my little ones and drag them to the store. It was much easier (and less expensive) to mix up a dough and bake the loaf or buns for supper. My children are older now but I still love the ability to bake my own bread products and save a trip to the market. I’ve been making my own bread for over a year now. I haven’t crunched the numbers, but it does really make a difference in those grocery bills! For a family of five, 10 slices of high-quality bread just to eat lunch is so expensive! Most of my baking ingredients come from Costco in bulk, and I buy whole wheat flour from Whole Foods by the case for a discount. I can’t recommend enough the “Artisan Bread in 5 minutes a Day” techniques. I highly suggest checking out that book from the library. I have modified their method for our family’s taste/needs, bake four loaves of bread at a time, and then I’m DONE baking bread for 4-5 days. It takes about 15 minutes of active time, tops. SOOOOO easy and very delicious! Crystal, I am so excited about this series. Thank you for coming up with this! I actually got a bread machine hoping to make more breads but I can’t get them to 1. look anywhere near right and 2. the taste is WAY off from the store bread we are used to. None of us mind how dense it is because well that’s bread when it’s not massed produced but I can’t get the taste awake from the floury. If someone has a good plain white bread recipe (not an Italian bread which I have a bit more luck with) I would love to know it. Does anyone have a easy cheap gluten free bread recipe that their kids love? Count me as a “making bread by hand” type. There is something very therapeutic about kneading – kind of liking getting your hands in good garden dirt in the spring. If you have never done it you are missing out. I use a hand mixer and wooden spoon for mixing, and then knead in the bowl to save getting the counter all dirty. It’s not as fun or as easy as kneading on the counter, so if you’re new to bread, start with kneading on the counter. I only use a whisk and wooden spoon for my French bread. There is something very satisfying about using just a few simple ingredients and tools to make a staple food. Bread (like many other foods) is one of those things that gets quicker and easier the more you do it. I’ve got my two favorite recipes memorized now, so no need to drag out the cookbook. I’ve more confidence now to improvise also. For example, I use to follow a separate recipe to make hamburger buns – but what work – so I rarely did. But one day while making my regular sandwich bread batch of 6 loaves, I had an idea. Instead of 6 loaves, I made 5 loaves and 8 rolls just the size for burgers. Cooked all together, and the rolls went in the freezer for whenever needed. It also tastes SOO much better. I save even more money by having TWO bread maker, tiny bit more work and twice the results! When my husband was laid off we wanted to start making our own bread, I have been chronically ill so I told him to go for it but the kneading was too hard for me. We let it go for a few days and then he remembered that he had a bread machine that he hadn’t touched in a decade- we now have fresh bread several days a week and it is the easiest thing in the world. When I am better I will make bread by hand again but the machine makes it possible for me to start bread during the day while he is at his new job. We do the organic whole grain thing so each loaf is roughly $1, I went to the store recently and the bread similar to what we make is over $4 a loaf. Yikes. A family of five that packs lunches uses a fair bit of bread during the week so we are saving at least $10 a week. I can’t wait to try the pita recipe Thanks! Do you ever make pita pizza? It is just pita, sauce, cheese (and precooked toppings if you choose to use them) cooked in the toaster oven, we find it is a great way to use up that last little bit of leftover pasta sauce/random veggies and the kids love it. I’m really excited for this series! I’m looking forward to learning some new tips for saving money. My mom always made homemade bread, and I’ve done the same since I’ve been married. I mix and knead my bread dough by hand. I still usually buy a loaf of bread on the side to have for sandwiches, but after seeing how much I could save by just going homemade, I’m definitely going to make the switch! We love homemade bread and I don’t have a bread machine. I actually gave mine away. I have a kitchenaide that mixes and kneads the dough for me. I prefer the taste to making it by hand so to speake vrs. bread machine. You can also make two loaves at a time vrs. one. I love to make bread too. We eat a lot of soup & bread dinners so we go through a lot of it. I love a no-knead Italian Peasant bread recipe I found a couple years back. You have to start the dough the night before, but it mixes up quickly. The end result is a lot like an EccePanis bread, and at $4 a loaf for that, you definitely same some “dough”! http://biology.clc.uc.edu/fankhauser/cheese/pane_rustica/pane_rustica.html This is where I originally found the recipe. I don’t use the towel to rise the dough, and I bake it on a pizza brick in the oven instead of the dutch oven. IT turns out beautifully every time. Loaves like these usually sell for $3.99 at the store, so it’s quite a savings. I mix and knead by hand; it’s very simple. I knead for 10 minutes, let it rise for an hour, spend another 2 minutes with it, let is rise for 10 minutes, spend 5 minutes reshaping the dough for the final rise. Including washing the bowl, it’s about 20 minutes hands-on for 4 loaves of bread. It cooks on cookie sheets, so you don’t even need bread pans. We use French Bread for sandwiches. After living in France and having sandwiches on baguettes, I grew to quickly love it! I make these breads when I speak in town, and they always meet with rave reviews. They’re really simple, too! I just wanted to let you know that the link at the bottom of the article: ” Looking for more? Click here to read other posts about 52 Different Ways to Save $100 Per Year ” is broken and results in an error page. I love this whole series and it occurred to me that while I will be happy to read each new article each week, I would like to be able to see at least the list of some or all of the ideas now, without a full text article so that I can start making my own strides in those areas right away! I’m so challenged by this and love the whole idea! Thank you! Once more than one post is added (i.e. next week), it should start working. My apologies on that bug! I was just describing this whole series, and my question, to my mom when I wondered, do you mean that next week when you click on the link you’ll be able to see the entries for the first two weeks? Or that you’ll be able to see headings/topics for all 52 weeks, though obviously not the articles themselves, when we click on the link. It’s only that if we only see one heading each week, then by the time we get to the end of the year, we’ll have saved considerably less than $5200. If we saw a longer list, we might be able to start saving in these areas on our own and then do even better in them once we get the advice from your article and the helpful comments from all the readers. Thanks again Crystal for everything that you do! Okay, Crystal, thanks for letting us know 🙂 Do you have any other sections on your website similar to this where I can troll for specific ideas like this? This motivates me to get the bread machine back out from the top shelf of the storage cabinet! We’re going to put that baby back to work! 1st on our list of recipes is pizza crust! So many to choose from here in the comments…it’s going to be fun trying to find the best one! I have successfully tried a lot of the reciepes on your sight Crystal, my husband loves the breadsticks! However, I still have not had much luck finding a sandwhich bread reciepe similar in consistency to store bought. Any suggestions? Mine always fall apart which doesn’t fair well with spreading peanut butter on them for my kids peanut butter and jelly sandwhiches. Homemade bread isn’t as tough as store bought. Try storing it in the fridge to keep it a little firmer for spreading things on. If you add a little wheat flour to the recipe, that might help too. I always use about 1/3 wheat and the rest bread flour. I hope this helps. I’ve been wanting to try making homemade bread, but am so intimidated. I got a kitchen Aid for Christmas (yay! ), so maybe I’ll actually do it? :) It’s intimidating! Crystal, do you always make your own bread, or do you supplement with $1 breads from the store as well? I’d like to make my own, and I’m inspired by the thought that others do this regularly. We use dollar store bread for sandwich bread. And if I can get really high-quality whole-wheat bread at the health food store for $1, I’ll typically pick it up, too. We make bread also. We started making bread in my mother’s bread machine when we found out our daughter is allergic to soy. Finding store bread without soy is nearly impossible so we started making it instead. I am looking forward to trying your recipes also! Thank you! I get mine at the Amish store. I pay about $10 for a 25 lb bag. It’s the best deal around where I live. I get most of my bulk baking items there. We buy wheat and then grind it ourselves. There are lots of option for electric grinders out there — it’s a good investment. I probably grind wheat about 1/month and do enough to last me for the month. I make about 4 loaves of bread a week and also use whole wheat flour in almost every recipe that calls for flour (anywhere from 1/5 of the flour whole wheat to 1/2 or more). And I do a whole wheat bread that is probably 80%+ whole wheat flour. Yes! One of my 2013 goals is to learn how to make homemade bread, defined as perfecting 6 types of new breads. I figured one every two months is enough of challenge for me. First up are french bread and pretzels (for our superbowl party). Planning on buying a bread machine today that makes two loaves at a time. So excited to start making some bread. Husband is usually the one that makes it but since I accidentally threw a piece of his bread machine away I am going to buy him a new one and start using it myself. Wish me luck! If you’re horrible at making bread (like me I have never had a good fully edible loaf yet but I’m still trying) check in your community for local commercial bakeries. For example, in Mesa, AZ (east side of Phoenix) there is Alpine Bakery. Their bread are sold at many grocery stores and whole food stores in the Mountain west. At their baking location they sell “day old” bread (not made that day or not “perfect” enough for grocery stores) for .50 a loaf. We buy their limit of 20 loafs and freeze them. They are healthy and about as cheap as making them ourselves. Check out what is in your area. Great suggestion! Thanks so much for sharing! Kneading is not that bad! I made all of our bread with no bread machine OR KitchenAid for quite awhile–until my hubby informed me that he doesn’t like dry bread for sandwiches and with just the two of us we couldn’t eat it up fast enough. Anyway, it’s totally doable and doesn’t take more than about 10 minutes hands-on time. I admit, the bread machine is even easier, but I do love the feel of good bread dough under my hands too! Do any of you ladies have good recipes for artisan bread? I’d love to learn how to make it! We are gluten free, but I love the idea of saving $100 per year – can’t wait for the rest of the series!!! Any suggestions for high altitude states? I have tried many recipes in my bread machine, no luck. They all turn out hard and dry or extremely dense. I am looking for a good whole wheat recipe. Any ideas?? I’ve ben making my own bread for over a year now. It’s not only cost saving but it is healthier and tastier! There have been a few time that I’ve run out and didn’t have time to make more so I bought some from the store. My husband and daughters do NOT care for it! Not even the more costly brands. I do make it the old fashion way, by hand, but it’s well worth it! Our family favorite is my Honey, Oat, Wheat Bread. It makes 2 loaves which typacly lasts our family of 6 a week. I LOVE making my own bread and have been doing so for over 6 months. It’s a HUGE way to save money. Focaccia, buns, rolls, specialty loaves… we do it all from scratch! I have a bread machine and I LOVE having fresh homemade bread. So far we have used it a lot to have bread with soup. I would really like to make our everyday sandwich bread. My question is – how do you keep the bread fresh after the first day? All other loaves I’ve made are very hard after the first day. Any suggestions on how to make the loaves last for sandwiches throughout the week? After my bread cools, I slice it and then put it back in the bread pan with plastic wrap loosely on it. It lasts a couple days before going stale…..but is usually gone in 2. Keep in mind that grocery store bread stays soft and doesn’t mold because it has additives & preservatives in it. REAL bread, the kind with very few ingredients will get stale (then we make croutons or french toast) and does grow mold (then the chickens get it) after a few days. Initially, for sandwiches, my family was hard to switch from the texture of store bought bread (light and super fluffy) to homemade which is more substantial, now everyone prefers homemade. I use the “green bags” and my bread will last for a week. This Amazon link will show you what I’m talking about. I’m not trying to sell anything just wanted to show you what I use. I received a bread maker for Christmas so I am new at this. Can anyone give me some tips? I made 2 loaves of bread they were good but very dense and heavy what are some lighter options? I did pizza dough and the machine sounded like it was going to strip a gear is that normal? The dough did turn out a bit tough. I used to bake all of my family’s bread, I would purchase the organic wheat berries, grind them and then make my favorite whole wheat bread recipe. I would make 5 loaves by hand at a time so I could fill the oven. I would freeze them for later. I figured out it cost me about $.77 to make organic bread using raw honey without the cost of the electricity to bake them. Then I discovered I can get organic bread (with the same ingredients as my homemade bread) for just $.80 a loaf at our local bread store. I still make most of our other baked goods but I just purchase our bread. Looking at a bread store may be another alternative to the higher costs at the grocery store. I use the Artisan Bread in 5 min/day recipe but put it in 2 loaf pans instead of 4 small round loafs. It’s no-knead, but still rises like a kneaded dough. Bread is SO EASY! Pizza dough, hamburger/hotdog buns, dinner rolls, breadsticks. Mmm…! Our Costco just started selling organic whole wheat flour too for around .80/lb. which isn’t bad if you don’t have access to Azure Standard or a grain grinder. My dad made the cinnamon roll recipe last weekend and I was able to snitch one… and even cold it was g.o.o.d! For some reason I do not own a bread pan (how did I get this far in life without one??) so I’m trying out your favorite homemade bread recipe in my bread maker right now. I think I’m going to start making our own bread each week as well. Thanks for this series! I look forward to seeing your other suggestions each week! I’m super excited to hear your tip every week! I don’t make bread very often, but when I do, I like to make my mother-in-law’s recipe for whole wheat honey bread. I’ll be honest, I’m a little surprised to read this on here! I frequently find the high-quality bread marked down at my store and also can get Healthy Life brand whole wheat for well under a dollar when it goes on sale and I pair it with a double $0.35 off coupon, which I find all the time. I stick it in the freezer and it works fine for us. For me, the time I would spend making bread is well worth the bit extra I might spend in the store. I’m curious, am I just lucky on finding good deals on bread? Yes, you are blessed, compared to many parts of the country — especially when it comes to high-quality breads! However, I (and a few other commentors on this post) are able to find high-quality bread for great deals sometimes. But for most parts of the country, this is an exception, not a rule. And specialty breads are even harder to find great deals on. So happy that you’re able to get such great deals at your store; that’s fantastic! What a great series! I am looking forward to it. I am going to make this tomorrow! And thanks for the freezing tip too…that’ll come in handy. Did you try it yet using half whole wheat flour yet? We made the breadsticks for dinner tonight. They were awesome. Made extra to put in the freezers for another meal. Made the dough then put in freezers before rising. I do this all the time and they always turn out well. Put the ones we were eating in frog for a while as I made the dough at lunchtime. Pulled those out about an hour before baking so they could warm up a bit. Even my picky 5 year old ate them, after he ate the carrots that were part of dinner. Oh yay! I’m so glad they were a hit with your family! I don’t eat a lot of bread but what I do, I bake, using my KA standing mixer. I heartily recommend King Arthur Flour’s Whole Grain Baking book. I’ve used several dozen recipes from the book and over 80% of the recipes I’ve tried are keepers, which is a phenomonally high percentage. So looking forward to the next 51 ways to save $100 this year! It actually is taking energy costs into account. If you read the article that I linked to, she included energy costs in the final price. So it really can add up to a great savings — especially if you bake your bread when you’re already planning to bake something else! This is my go-to bread recipe. No kneading involved, and it’s extremely versatile. You can keep the dough in the fridge for two weeks and make loaves, pizza, naan, calzones, stromboli, bagels, etc. with it as needed. It’s not light and fluffy like store-bought, but it’s tasty and simple. My hubby bought me the book and it’s got more recipes with the same method, including gluten-free! I got a bread maker for free off of freecycle 4 years ago and it’s still going strong! I really love it now since I went back to work full time after 7 years at home with my son. The delayed timer is the best. I just set it so that the bread will be hot and ready for dinner when we get home from work! Right now, I use a bread machine; but I’ll soon be transitioning to using a KitchenAid and baking breads in the oven. This is wonderful! I wish my oven worked though. But I am eagerly waiting to read the next post of how to save even more! thanks! We just got a bread machine for christmas!! We made a loaf over the weekend and loved it. I made bread from scratch before and it takes hours to make one loaf. The machine does all the work, I love it. My son has food allergies to milk, soy, nuts and tree nuts so finding a bread that is free off all of those is hard. We were going to a bakery and hour away just to find allergy friendly bread at a good price ($2.19 a loaf instead of $4-6 at grocery or health food stores). Now I can make bread instead of driving an hour!! I tried the pita pocket recipe today – loved it! My MIL gave my husband a bread maker for his birthday one year and it’s been the best gift he’s ever been given 😉 We make a lot of our own breads and pizza crust and while it can sometimes be time-consuming, we like it much better than anything we’ve bought in the store. Plus, it’s cheaper! I have been wanting to do this for awhile now. Your post gave me the push. My husband is the bread connoisseur. I’ve tried the cheap store bought bread but that really didn’t go over well with him. Not to mention it’s not good for you. So I have to buy the more expensive bread. Anywhere from $4-$5 a loaf when not on sale. He loves 100% whole wheat or what I like to call bird seed bread. As for freezing. I usually buy 3 loaves a week and freeze. My family has sandwiches everyday and those 1.5 lb short loaves do not last. But what I’ve noticed on the packaging is they wrap the bread in cellophane then the bread is put into the plastic bag. I’ve never had a problem with bread wrapped like that and freezing. I wonder if the same procedure would work with homemade bread? I also have saved the plastic bags from the 1.5 lb loaves to use for my homemade bread. My breadmaker’s been collecting dust… I think I’ll break it out and start using it to save some “dough” 🙂 Question: I’ve never baked the bread in the oven and I’m not sure what kind of pan to use. 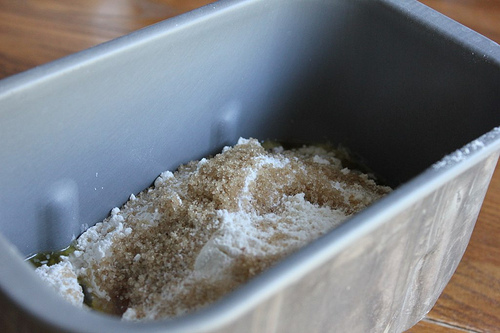 Can I use a glass loaf pan or should it be a metal baking pan? Thanks! I’ve used both and it comes out fine, you just may have to adjust the cooking time. Hi! Can you guys enable comments for the bread posting? It would be great to read through them for additional money saving ideas. Thanks so much. Never mind, apparently my computer was just being super slow in loading them, thanks. What bread is that in the first picture with the brown sugar? Looks yummy and I would love to try it out.